A great book is no longer enough. An author platform is the most powerful key to success in today's saturated market, and increasingly, publishers are demanding that new authors come to them with an existing audience of interested followers. Authors who are self-publishing have an even bigger need to build an engaged audience. Social media makes building the writer platform easier than ever, but, unfortunately, most authors struggle to get it right. How can authors create their unique platform, connect with followers, write a manuscript, and grow their business? 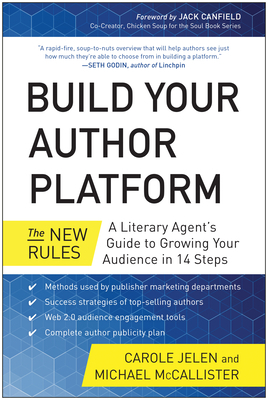 In Build Your Author Platform: The New Rules, top literary agent Carole Jelen and tech expert Michael McCallister apply their combined 35 years of expertise to outline 14 practical, hands-on steps to create a presence that will produce high book sales and expanded audience. Filled with detailed lessons, examples, success stories, and techniques used by marketing departments at major publishers, Build Your Author Platform is an indispensable guide for anyone looking for insight into publishing, promoting, and marketing books. Carole Jelen, founder of Jelen Publishing and vice president of Waterside Productions, has been representing authors as a top-producing agent for over two decades. She specializes in areas of tech, business, and self-help. Jelen holds a master's degree in English/Linguistics from the University of California, Los Angeles. Carole also speaks at writing/publishing conferences and works as a publishing consultant, aiding authors and companies in the publishing process. Mike McCallister is a writer, programmer, web designer, and software tester with an in-depth understanding of the digital world. He is the author of openSUSE Linux Unleashed and co-author (with Bud Smith) of WordPress in Depth. McCallister is committed to helping people make the most of "tech tools" and was named one of the Mindtouch Most Influential in Technical Communication and Content Strategy. McCallister is president of his local Society for Technical Communication chapter and works as the Senior Document Architect at PKWARE.